I was recently taken by a couple of netsuke that came in to us from a Big Island Collection. These were two South Pacific Islander netsuke. Being in the Pacific on islands in Hawaii I immediately liked the subject. 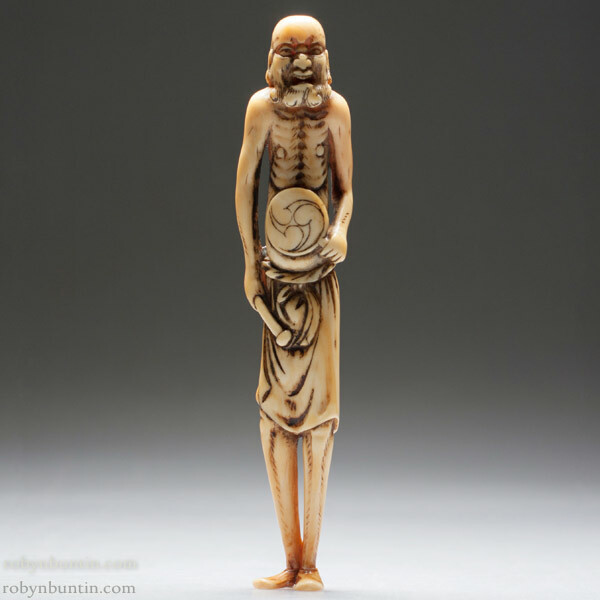 One sashi netsuke out of ivory is of a man with only a loincloth on and a drum in his hand. He is standing tall with curly hair and his mouth slightly open. It turns out that he is an Okinawan. I consulted with my physician who is Okinawan and knows quite a bit of Okinawan history. He told me about the symbol on the drum of three balls swirling in the left hand direction, being a symbol of the Okinawan Kingdom. The story goes that a great General sacrificed his life after Okinawa was attacked by mainland Japanese. He had been captured and held hostage, standing on a cliff next to the sea, he broke the ropes that the Samurai had tied him with and threw himself into the sea with two guarding him. When the three plunged into the ocean the three forms created this image of three swirling balls. After fending off the attack the King took symbol to stand for Okinawa and the Ryukyu islands. Okinawan’s were also known to be able to make it rain, thus the drum and open mouth, chanting. What a perfect story for a netsuke with special powers. The other netsuke of a South Sea Islander is called a “Kurombo”. We see more of these, but the story is also very interesting. He is shown squatting over a basket or bowl with a branch of red coral. He is carved in a very dark blackwood, maybe ebony. The word “kuro” is of course the color black and added with “bo” or “one” or “boy”, so litteraly “Black one”. The idea that all great red coral or treasure, comes from the South Pacific has long been a standard depiction. Upon some research it turns out there might be a further interesting element of the possibility that the Portugese might have picked up someone from the port of Columbo in Ceylon and the Japanese saw this dark skinned individual either aboard their ship or with them when they landed in Japan. So of course it led me to wonder in a traditional context what a Hawaiian Islander might be depicted as. Maybe a hula maiden with a branch of black coral? A canoe paddler with a feathered god? Whatever the case it led me to fantasize the possibilities and all the interactions that were never recorded between those in the Pacific Ocean. Only to be depicted in netsuke of these interesting forms. Virtual Tour of the gallery – We’re on the Map!